The function of this system is to supply the blood with oxygen. The type of tissue found in alveoli is epithelial. The type of capillaries in alveoli is pulmonary. 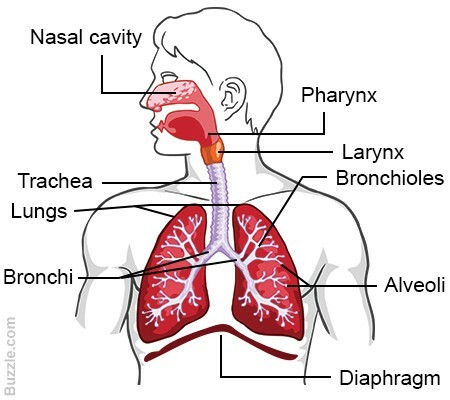 The exchange of oxygen and carbon dioxide occurs in the many alveoli in the lungs. 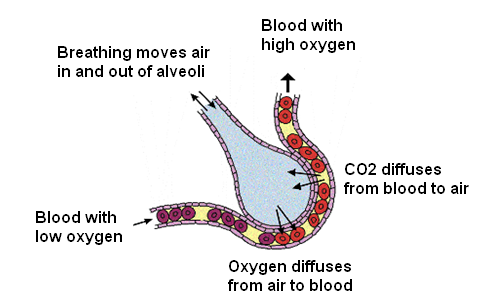 As shown above, inhaled oxygen moves from the alveoli to the blood in the capillaries, and carbon dioxide moves from the blood in the capillaries to the air in the alveoli. Asthma is a condition in which a person's airways become swollen, narrow, and produce more mucus. People with this condition experience coughing and wheezing. Treatment includes inhalant steroids, sold over the counter or with proscription. Bronchitis is a condition where lining of bronchial tubes become inflamed, which carry air to and from the lungs. Symptoms include fever, chills, fatigue, coughing and wheezing. Bronchitis can be treated with antibiotics, pain relievers, or steroids.